Lots of people download movies illegally. Or spoof their IP addresses to get access to sports fixtures. Or use random images they found on the web in publications and presentations (I've even seen these with the watermark of the copyright owner on them!). Or download PDFs for people who aren't entitled to access (#icanhazpdf). Or use sketchy Russian paywall-crumbling hacks. It's kind of how the world works these days. And I realize that some of these things don't even sound illegal. This might surprise some people, because I go on so much about sharing content, open geoscience, and so on. But I am an annoying stickler for copyright rules. I want people to be able to re-use any content they like, without breaking the law. And if people don't want to share their stuff, then I don't want to share it. I don't want to share closed stuff as if it was open. If someone doesn't openly license their stuff, they don't deserve the signal boost — they told the world to keep their stuff secret. Why would I give them the social and ethical benefits of open access while they enjoy the financial benefits of closed content? This monetary benefit comes from a different segment of the audience, obviously. At least half the people who download a movie illegally would not, I submit, have bought the movie at a fair price. So make a stand for open content! Don't share stuff that the creator didn't give you permission to share. They don't deserve your gain filter. Not a comprehensive answer either, but much more brilliantI just found myself typing a long email in reply to the question, "What is a Creative Commons license and how do I use it?" Instead, I thought I'd post it here. Note: I am not a lawyer, and this is not a comprehensive answer. There is no relinquishment of copyright. This is important. In the case of 52 Things, Agile Geoscience is the copyright holder. In the case of an article, it's the authors themselves, unless the publisher gets them to sign a form relinquishing it. Copyright is an automatic, moral right (under the Berne Convention), and boils down to the right to be identified as the authors of the work ('attribution'). Most copyright holders grant licenses to re-use their work. For instance, you can pay hundreds of dollars to reproduce a couple of pages from an SPE manual for a classroom of students (if you are insane). You can reprint material from a book or journal article — again, usually for a fee. These licenses are usually non-exclusive, non-transferable, and use-specific. And the licensee must (a) ask and (b) pay the licensor (that is, the copyright holder). This is 'the traditional model'. Some copyright holders are even more awesome. They recognize that (a) it's a hassle to always have to ask, and (b) they'd rather have the work spread than charge for it and stop it spreading. They wish to publish 'open' content. It's exactly like open source software. Creative Commons is one, very widespread, license you can apply to your work that means (a) they don't have to ask to re-use it, and (b) they don't have to pay. You can impose various restrictions if you must. Creative Commons licenses are everywhere. You can apply Creative Commons licenses at will, to anything you like. For example, you can CC-license your YouTube videos or Flickr photos. We CC-license our blog posts. Almost everything in Wikipedia is CC-licensed. You could CC-license a single article in a magazine (in fact, I somewhat sneakily did this last February). You could even CC-license a scientific journal (imagine!). Just look at all the open content in the world! I recommend CC-BY licenses. There are lots of open licenses, but CC-BY strikes a good balance between being well-documented and trusted, and being truly open (though it is not recognized as such, on a technicality, by copyfree.org). The main point is that they are very open, allowing anyone to use the work in any way, provided they attribute it to the author and copyright holder — it's just like scientific citation, in a way. Do you openly license your work? Or do you wish more people did? Do you notice open licenses? 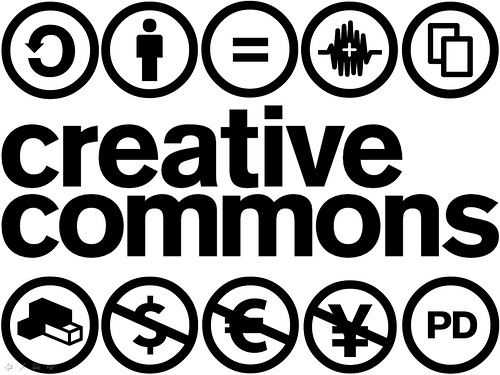 Creative Commons graphic by Flickr user Michael Porter. The cartoon is from Nerdson, and licensed CC-BY. 'Obscurity is a greater threat than piracy' is paraphrased from a quote by Tim O'Reilly, publishing 2.0 legend.